Sheriff Duane Burgess is committed to guiding the Sheriff’s Office in the right direction and leading the best Law Enforcement Officers in the state in serving the citizens they are sworn to protect. The Sheriff’s Office Administration Staff is comprised of many talented, dedicated public servants who lead the agency and its divisions. Text JOHNSONCOSHF to 888777 to register for local alerts. 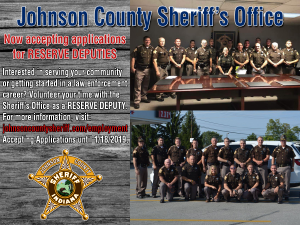 The Johnson County Sheriff’s Office is accepting applications for the volunteer position of Reserve Deputy until January 18, 2019. Reserve Deputies are non-paid deputies who carry full law enforcement powers once they have successfully completed all training. Reserves work 16 hours per month during busy shifts and are required to participate in additional details throughout the year. Many of our Reserves serve with the Sheriff’s Office to give back to their community or to begin a full-time law enforcement career. 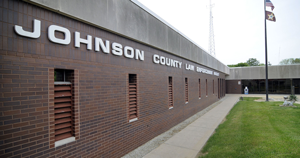 Notice is hereby given that Johnson County Sheriff’s Office, by the Board of Commissioners of Johnson County, Indiana, hereinafter referred to as the County, will receive sealed bids for purchase of a replacement security system as described herein. Bid packets are available by clicking the button below or at the Johnson County Sheriff’s Office, 1091 Hospital Road, Franklin, Indiana 46131, between the hours of 8:00 a.m. and 4:30 p.m. Please direct all questions concerning the bid process to Major Duane Burgess at (317) 346-4605. Sheriff Doug Cox is pleased to announce the Thirteenth Annual Johnson County Sheriff’s Charity Ride will be held on Saturday, August 25, 2018. Riders will once again assemble at the Franklin Wal-Mart store with registration beginning at 8:00 a.m.
As always, the ride will benefit local Johnson County charities based on needs in the community. Johnson County Indiana Sheriff's Office shared a post. Today the Johnson County Sheriff's Office and Franklin Police Department conducted a drug round up involving over 50 suspected drug dealers. Multiple agencies from Johnson County, Marion County and the US Marshals assisted in conducting the warrant sweep. I am very proud of the work that has been done to take these individuals off the street. The citizens of Johnson County need to feel safe and we need to be very vigilant in keeping our children safe from these individuals who deal in illegal narcotics. Our work isn't complete and we will continue to work diligently to make Johnson County safe.